Refrigerators do break down. It’s not uncommon. Basically, it’s natural if you think of the efforts they make day and night to refrigerate drinks and food. When they don’t function well, call our Pasadena refrigerator repair technicians. We fix fridges as soon as possible and are trained to handle problems with refrigerators of all makes and types in the California market. One of our technicians can also drop by to change the water filters or evaluate the condition of your appliance. We prevent issues by offering maintenance and our staff at Around Town Appliance Repair Pasadena, CA, takes care of any concern related to home refrigerators. What’s your fridge problem today? * Do you have refrigerator defrost problems? * Is the appliance noisy? * Is the fresh food compartment warm? * Is water leaking from the fridge? * Is the freezer or fridge door gasket worn? Let our specialized fridge technician deal with such problems. When it comes to refrigerator issues, our professionals make an effort to assist the client as soon as they can. We also offer same day service in the Pasadena area and arrive in your house equipped so that the faulty switches, condenser or fan will be replaced and the appliance will be fixed in due time. 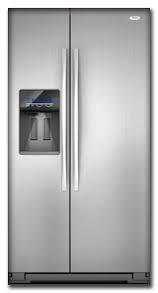 We provide fridge troubleshooting, make fast diagnosis of the problem and offer the best fridge repair solutions. At our Appliance Repair in Pasadena, we have a policy of helping customers in timely fashion especially when fridge problems are involved. With full understanding of your agony and the urgency to fix this particular kitchen appliance fast, we do provide fast response refrigerator repair. Our company can supply new parts when the existing ones are damaged and our technicians replace and install them when it works well for you. Do you want to prevent fridge issues? Simply trust our routine fridge service. With maintenance, problems are eliminated because components are checked and fixed before they break down. Well-maintained refrigerators don’t waste energy or break down unexpectedly and they last much longer. Let us help you with these things. Call us if you have troubles, concerns or simply want routine refrigerator service.